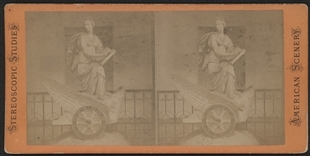 This marble sculpture of Clio, the Greek muse of history, in her clock-wheeled chariot, has long been a popular symbol of the House. 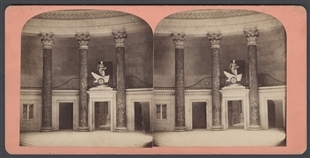 This stereoview was likely a souvenir for a tourist visiting the Capitol, where the statue was perched in Statuary Hall. It was carved by Carlo Franzoni in 1819, and she watched over the House through its four decades meeting in the room, and over visitors to the Capitol ever since. 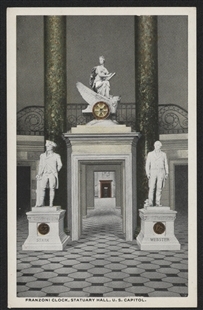 The Speaker's Lobby—situated directly outside the House Chamber in the U.S. Capitol—is a long corridor featuring portraits of past Speakers of the U.S. House of Representatives. In this video, House Curator Farar P. Elliott describes and recounts the history of the space.